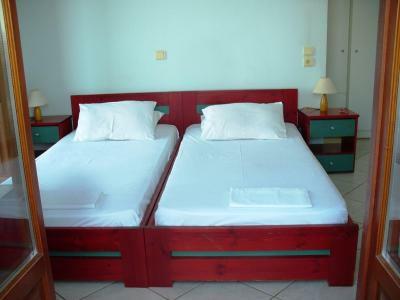 Lock in a great price for Xenios Zeus Rooms – rated 8.9 by recent guests! A delightful surprise in a wonderful, not over-developed town with the engaging feel of an old Greek coastal village, and a spectacular nearby beach (Zara). Neighbors in the apartments report that they are annual visitors, and we can readily understand why. 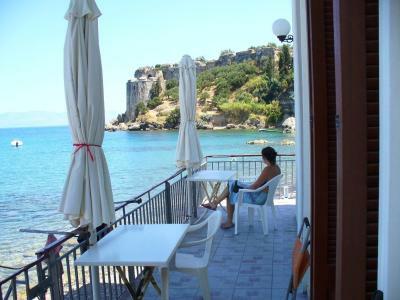 Koroni is a gem of a town and the Xenios Zeus rooms a perfect way to visit. The location of this small hotel is spectacular!! Literally 10 steps from our room and we were swimming in the sea under a magnificent Venetian castle ruin. Despite being very close to bars & restaurants the hotel is very quiet & private. We have been here several times and it’s always even better than we remembered. The place was quiet - although being right on the beach the waves were more noisy than I expected the first night and then I got used to it. It was clean and the owner was helpful and friendly. I liked having use of a kitchen and the "treats" left out for us. It was very clean. And easy to walk into the town, upto the castle and monastery and over to Zaga beach which is much bigger. Koroni is very nice. Most beautiful location with views of the sea and the Kastro on the hill. Rooms not fancy, but the bed was sooo comfie. Even though there was no breakfast, there were always cookies first thing in the morning. This is a lovely old property with simple, very clean rooms. If you love the sound of the sea this is the place to be as you couldn't get any closer. Use of a kitchen means that you can make tea or coffee in the morning, provided by the owner, or even make meals if you want to. The view of the castle is the final touch. The historic feel of the property and the location just next to waterfront and the castle. We did have a sea view and great view of the fortress lights from balcony as well as direct access to the beach, also both in room and shared catering facilities where host leaves free snacks for guests. We were graciously provided with parking outside the rooms although there is good public parking nearby. 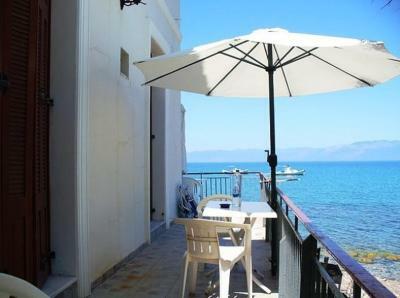 You can sleep to the sound of the sea on the shore and step from balcony to see or practically onto the quay lot into a taverna. 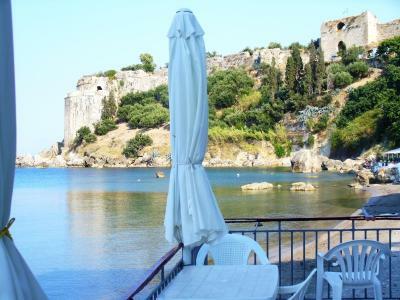 Located on a beach of Koroni, Xenios Zeus Rooms offer accommodations with views of the sea and the Venetian Castle of the area. Free Wi-Fi is available throughout the property. All air-conditioned rooms at Xenios Zeus are bright and open to a balcony. Each features a mini fridge and a smart TV. A private bathroom with a shower is included. Some have a kitchenette with a cooking ring. 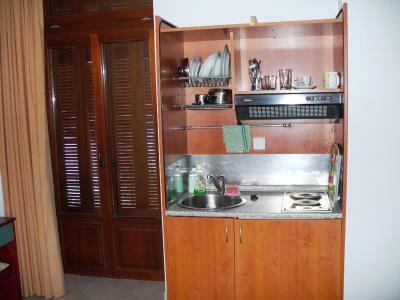 The complex features a common fully equipped kitchen, while the front desk is available 24 hours a day. Free parking can be found near the property. 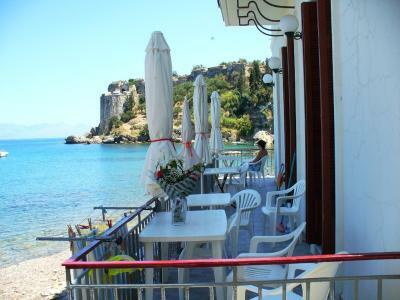 Within 98 feet, guests can reach the main square of Koroni featuring traditional taverns. A super market can be found at 150 feet. The seaside town of Foinikounta is a 20-minute drive away. 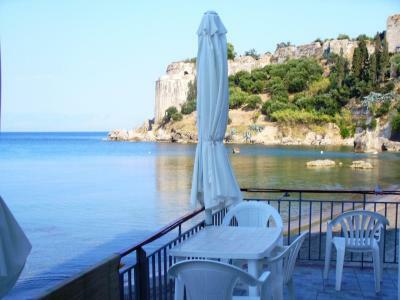 This property is also rated for the best value in Koroni! Guests are getting more for their money when compared to other properties in this city. When would you like to stay at Xenios Zeus Rooms? 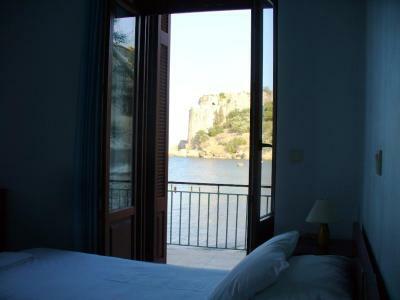 These air-conditioned rooms are bright and open to a balcony with sea and castle views. They feature a mini fridge and a smart TV. A private bathroom with a shower is included. Some have a kitchenette with a cooking ring. House Rules Xenios Zeus Rooms takes special requests – add in the next step! Xenios Zeus Rooms accepts these cards and reserves the right to temporarily hold an amount prior to arrival. Kindly note that guests staying for more than 4 days, can use the common washing machine. Nothing except one guest making "coffee" at 1.30 in the morning! Try booking the front rooms... the ones at the back are lacking space. Broken French door to balcony let in water during storm and was difficult to open. Kettle was in exterior shared kitchen although Greek coffee burner was in The room kitchenette with stove. The balcony looking into beach is shared but abuts a concrete warehouse wall which is not too attractive. Some language difficulties with host. A little difficult to reach with a car (a price you pay for town center location and proximity to the sea). I suspent we got the only room with street view - all other rooms seem to be with sea view. It was compensated however by the personal table and chairs on the shared balcony. Nearest beaches are not so good. No official reception, you have to look for the hostess. As close to the sea as it can be - the water is literally 2 meters away. Center location but quiet. Nice lady hostess. Great free cookies and nuts (+ tea and coffee). Free sunchairs and umbrella for the beach. 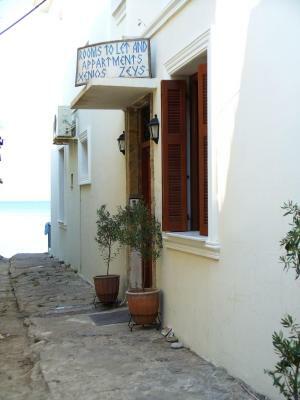 We wanted to stay a night longer than booked originally - we were offered a big 2-bedroom apartment in the neighboring Xenios Zeus Apartments for the same price. Hint: get up early and go find the traditional bakery nearby - the smell is fantastic, you can watch the process and buy some nice pastry for breakfast while cafes and tavernas are still closed. Best location !!! Private beach and amazing view from the room. We stayed there 3 nights but we wanted to stay much longer. 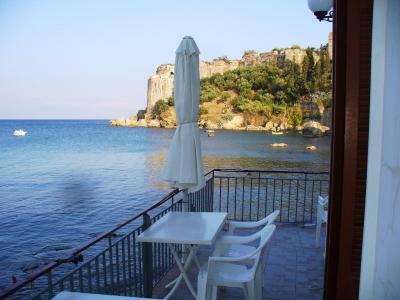 Koroni is a great place!! The location is perfect, with the beach literally on the doorstop and a few minutes walk to the town for excellent restaurants and shops. Nothing - it was fantastic!!!! !